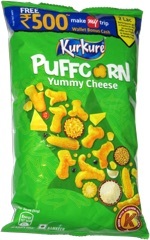 Taste test: Sour cream and onion is usually a very popular flavor around the chip bowl, but not this bag. These chips are very thin, and they have the greasy sort of taste that other soybean oil-cooked chips have (it's sort of similar to the taste of chips that are cooked in lard). 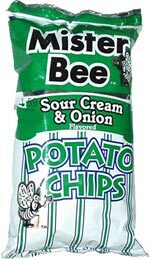 Between the thinness of the chips and the mild greasiness of the taste, the sour cream and onion flavor really doesn't stand out very well, and you get just a very mild, somewhat creamy flavoring in an overall greasy potato taste. Smell test: Very nice, mild creamy onion smell. This snack was discovered . Review published .